The president of regional Asom Gana Parishad and Assam Agriculture minister, Atul Bora today accused the ruling BJP of indulging in politics of mudslinging during panchayat election in the state. He claimed that the saffron party which has contested panchayat election in Assam for the first time, would not be able to put up a good show. The AGP president, who became a permanent resident of Bokakhat sub-division before the last Assembly election of 2016 in the state, today cast his vote in first phase of panchayat election this morning at 77 Jyoti Vidyapeeth polling statios under Mohmaiki Gaon Panchayat in Bokakhat Sub-division. 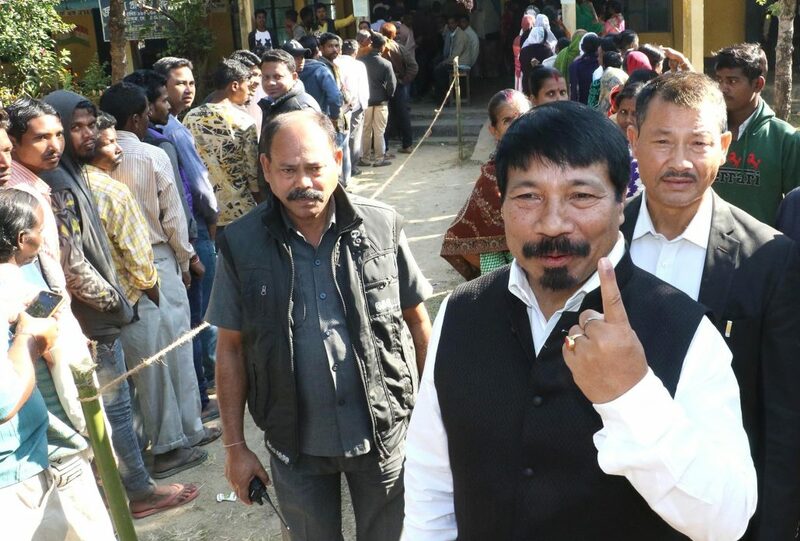 The AGP president who represents Bokakhat Legislative Assembly Constituency (LAC) in Assam House, stood in the queue with common voters while waiting for his turn to vote. Bora became the Agriculture Minister in Sarbananda Sonowal-headed Assam government after BJP-led coalition which has AGP as a constituent, had come to power after 2016 Assembly election in the state. With AGP and the BJP fighting panchayat election separately, Atul Bora faces a challenge to win all the 20 Gaon Panchayats for the AGP in his home Assembly constituency. Bokakhat LAC is witnessing a three-cornered contest in Panchayat election among the AGP, BJP and Congress. The AGP had faced criticism for fielding some candidates with tainted background in Panchayat election in Bokakhat sub-division where public allegations are rife about use of money and wine in panchayat elections to lure voters.